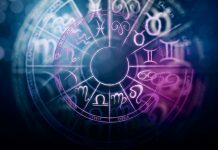 Last week i was invited for a birthday themed party. My friend specifically requested that “if it’s not much of a problem i should do some birthday themed nail art designs on my nails”. Basically i was supposed to decorate my nails for this birthday. I straightaway remembered my childhood days when my mom used to host my nail polish birthday parties. All my friends were given few nail polish colors to come up with something. Back then we used to create whatever comes to our minds and whoever decorates her nails best, was given a gift. 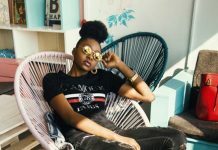 I was pretty excited for this birthday, while searching for some cool birthday themed nail art designs i have compiled a good list of some amazing birthday nail art designs, ideas for you to try. 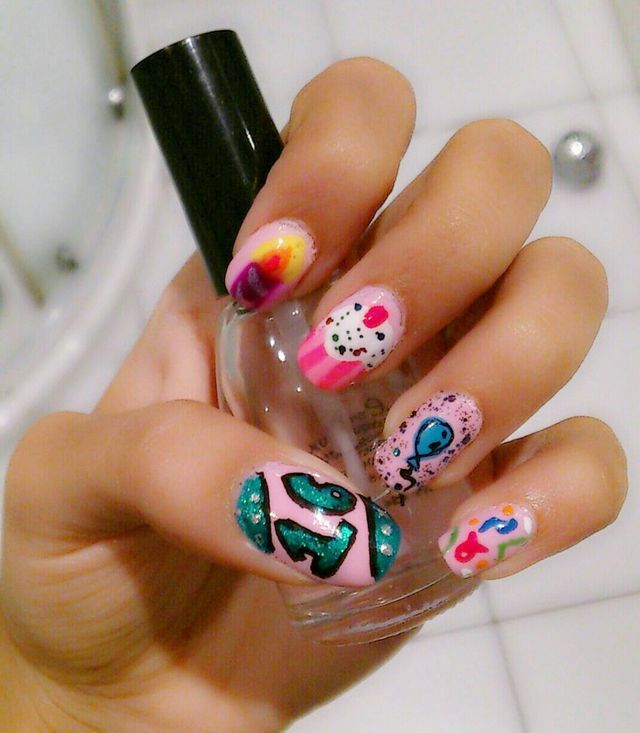 Basically, birthday themed nail art designs can cover anything related to a birthday party. 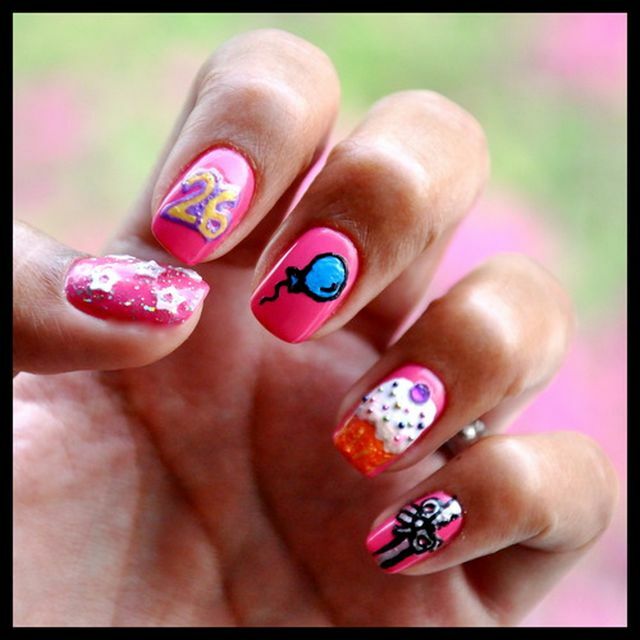 It could be birthday cake designed on your nails, birthday decoration items created on nails with different nail colors, birthday balloons, birthday candles, birthday cupcakes or birthday candles. 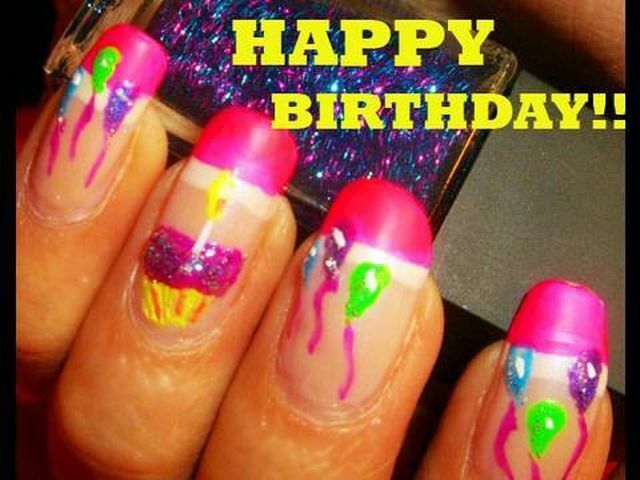 Given below are few birthday themed nail art design ideas which you can try with little creativity. 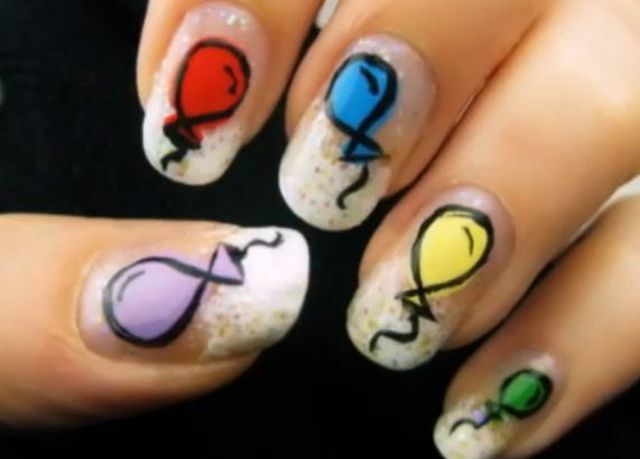 You can create various shapes and sizes of balloons on nails. Use as many colors as your kid like. Let the kid use her creativity with color, shapes, stones, beads etc and set her own trend. 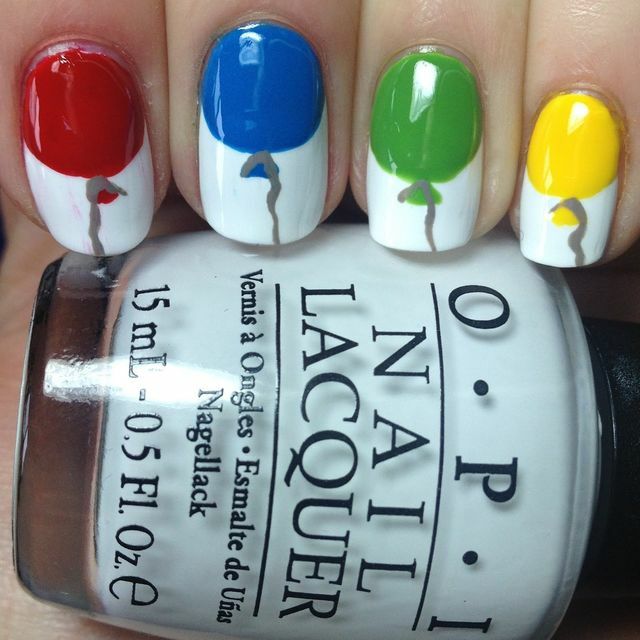 Apply a base coat, use various colors to give a balloon shape on your nails. 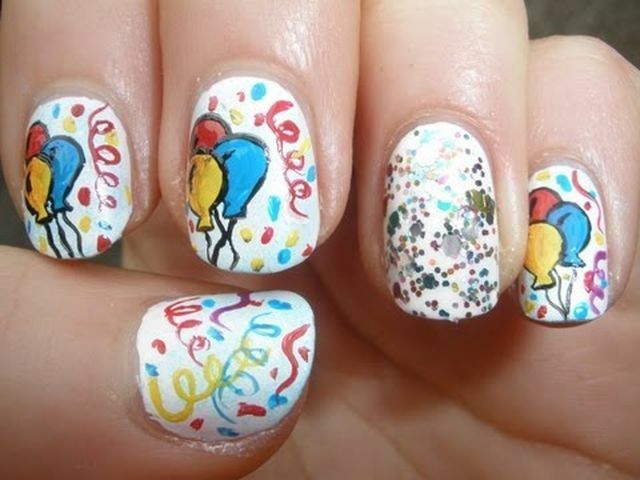 Outline the balloons with black paint, finally finish the nail art with some glitters or a coat of white/ silver nail glitters. 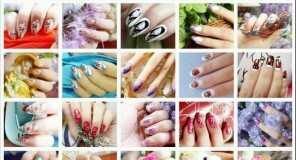 If you are in a rush and want to finish with nail art fast, no worries. Just use floss gloss nail paints. 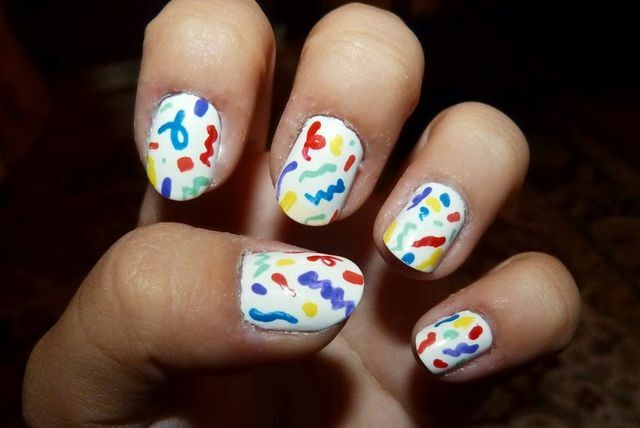 Apply a base coat of white, create balloons shapes on your nails ( you can make a big balloon or many small balloons on the nails) and you are ready. Apply a base coat of bright color ( all time girls favorite pink will look good). Use some glitters to decorate, write birthday girl’s name on the one of your nail, create a balloon, a cupcake, birthday candles etc on different fingers . Apply a transparent base coat. Use different color to highlight the tips ( pink- white, black-white, green- white etc), create balloon or candles on the ring fingers ( you can do it on alternate fingers too). 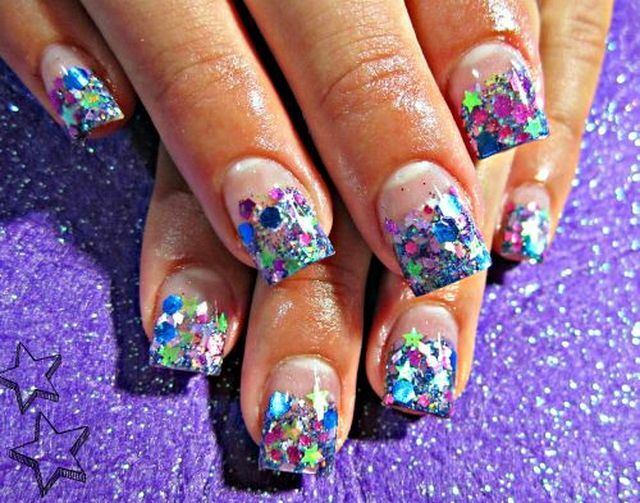 Give it a perfection, finish the nail art with glitters or beads. Apply a base coat of blue color. Use light and dark pink color to create the base of cupcake. Make the top of the cupcake using white color. finally decorate it with various colors dot/ colored beads. 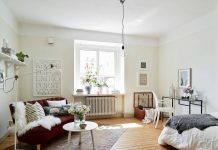 Apply a white base coat. Use various color to create dots. 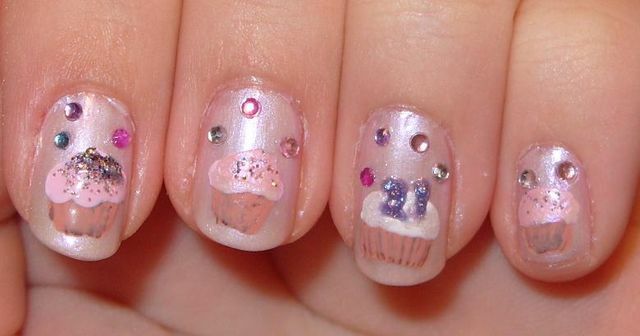 Develop a cup cake on the ring fingers as stated above. Apply a lighter glossy base coat. Use a toner dark color to create cupcakes. Complete the nail art with beads and glitters. 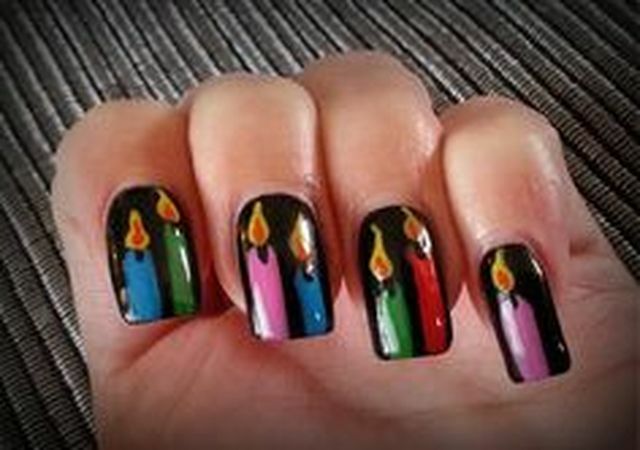 Apply a base coat of darker color ( black, purple etc) Use various colors to create the candles. Use yellow and orange color to create the flame of the candle, and finally finish the look with highlighting the candles with white stripes. 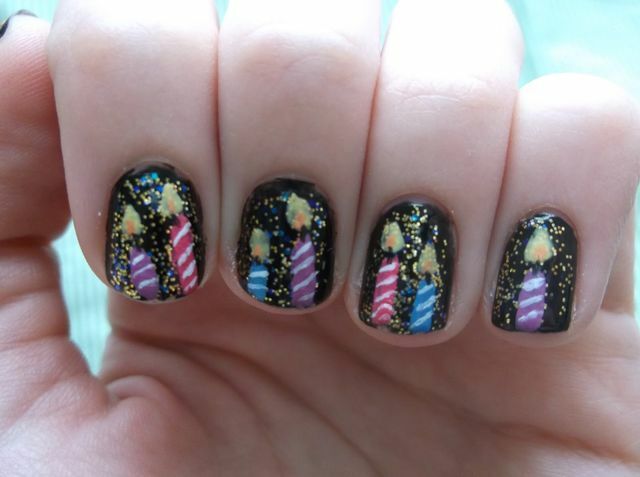 In case you are going for a day birthday party, make birthday candle nails using lighter color. 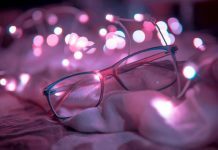 Apply a base of light blue color, cover the tips with white ( adds dots or glitters ), make candles of different color, and flames with yellow and orange color. Birthday party is incomplete without decoration, so is the birthday nail art. Try as many patterns or decorations as many as you can. Create your own nail art style by making balloons, zig-zag ribbons, stars, glitters and other birthday decoration items on your fingernails. Apply a base of transparent color. 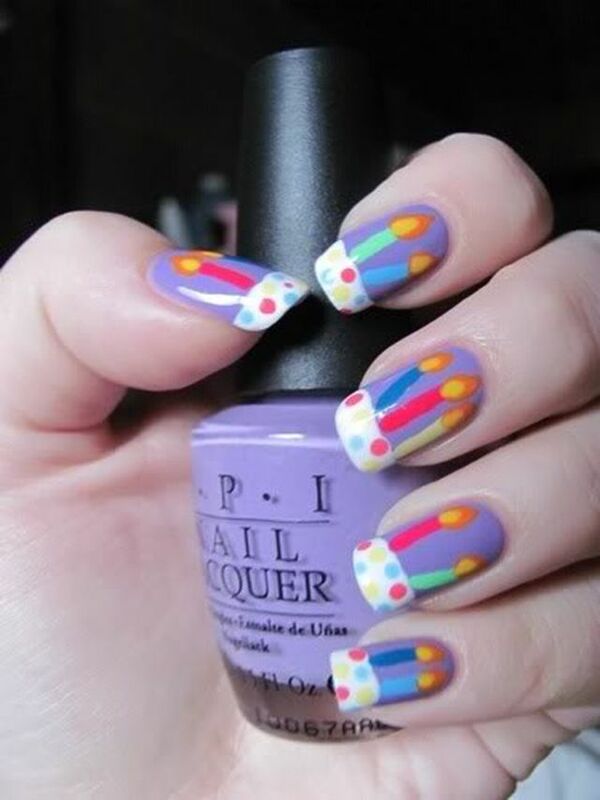 Use beads to cover the tips or you can even use the beads stickers on the tips to complete the look. Apply a base coat of lighter color ( baby pink, white, transparent, sky blue etc) . 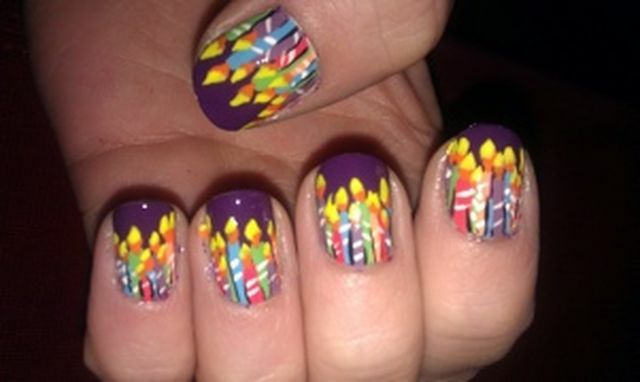 Create candles, cupcakes, balloon, ribbon shaped decoration etc on the nails and you are ready for the party. 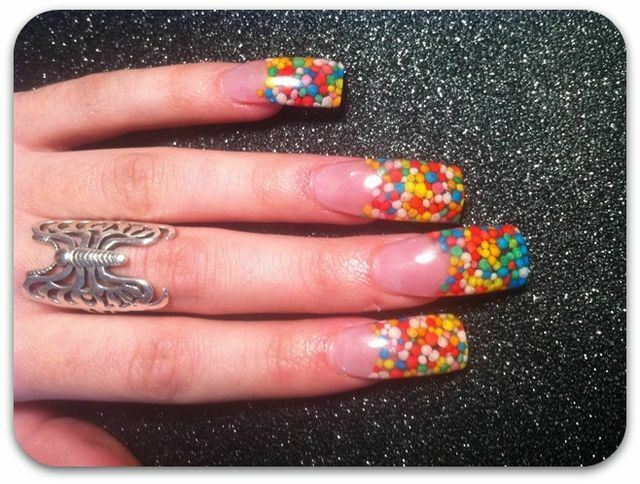 How about this trendy birthday bling nail art? use different colors, create stripes, add beads, add bow etc. to get the desired look. In case your kid is wearing white dress or a princess dress this bling will just be the right one. Apply a transparent base coat. Add heart shaped, bow shaped ( different shaped beads available easily in market) , add some white color or pastel color beads to complete the look. 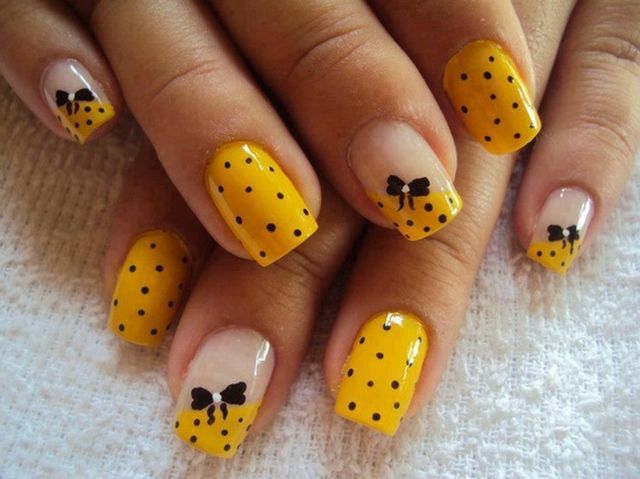 If you are looking for some trendy and simple nail designs, you will love this one. Apply a base coat of black and transparent shade alternately. Add some multicolor glitters on the black shades and some fancy beads to the transparent one. Apply a yellow and transparent base coat on alternate fingers. Cover the tips of transparent one with yellow color. Add black dots on the fingers and tips. To complete the look create a black bow with white color center dot. Apply a transparent base coat. 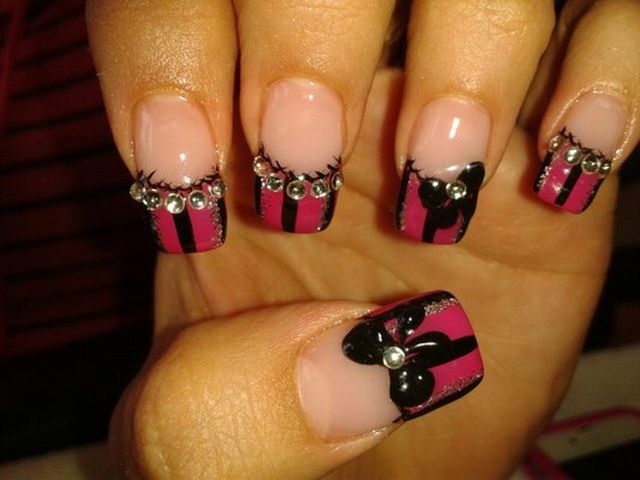 Use dark pink and black color to cover the tips. Finally add white beads, a black bow and some glitters to complete the look. Apply a base coat of transparent color. Cover the tips with various color stars, glitters, and some randomly placed beads. 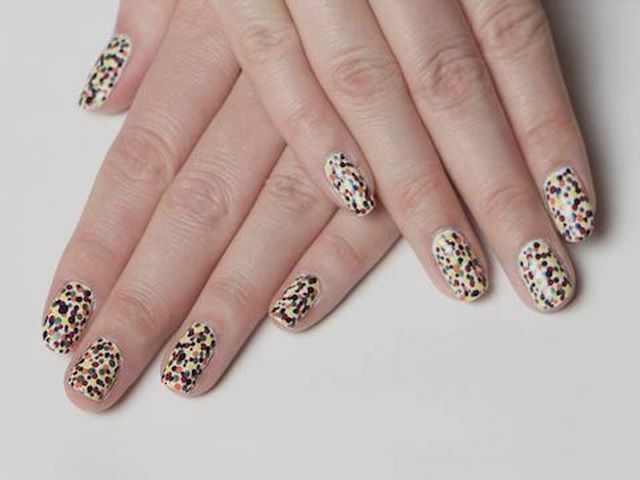 This is very nice nail art design but just keep in mind that creating this nail art will take considerable time since sticking beads and letting it dry is a time taking affair. Apply a base coat of white color, use various colors to make some random zig-zag ( birthday ribbons ) patterns. 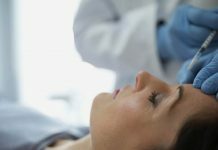 This is very simple and can be done in very quick time. 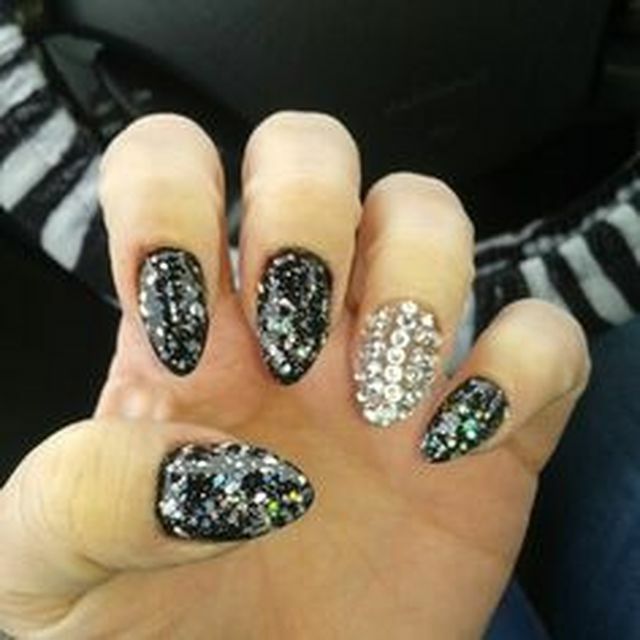 You can even add some symmetrical glitters on white base nails also ( as shown below). 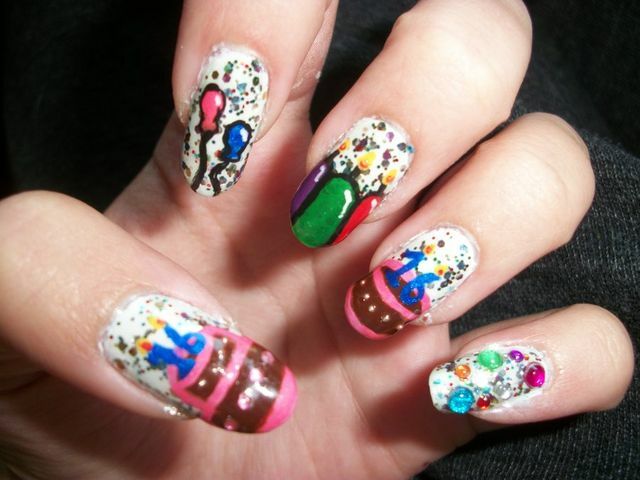 So, which of these is your favorite birthday themed nail art? 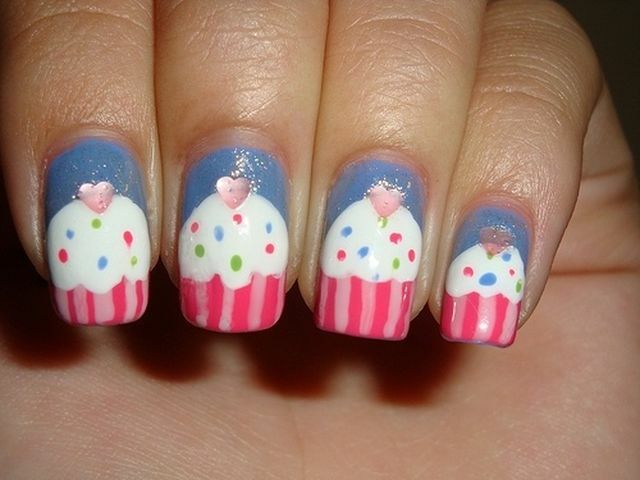 Which birthday themed nail art design you are going to try very soon. 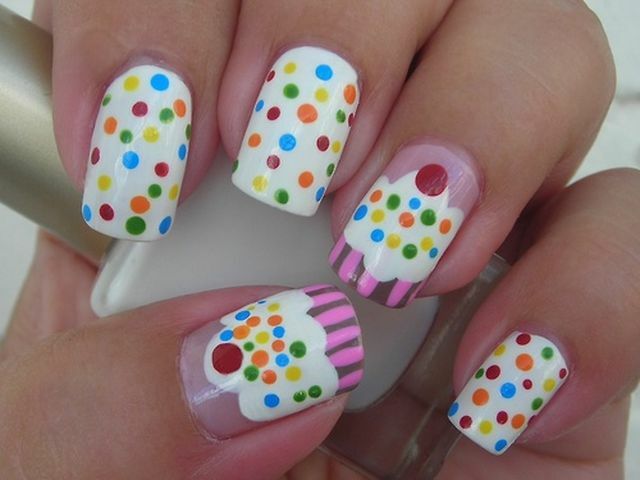 Please leave us a comment and share more birthday themed nail art design ideas with us.